The tales of Jackal and Wolf are to South Africans what apple pie is to Americans. No one should grow up without them. Yet the sly Jackal and the whimsical Wolf is older than apple pie. These stories come from the Khoi-Khoi, a group of Bushmen who narrated them into existence shortly after the Stone Age. 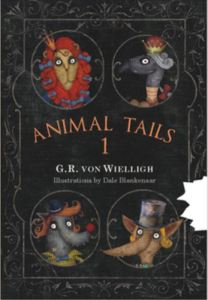 Animal Tales Volume 1 is the first book in a series of animal stories compiled by G. R. von Wielligh, who heard them as a child and who spent his adult life documenting them for future generations. In this edition, freshly translated into modern English, the stories get a new look thanks to the beautiful, full-color illustrations of Dale Blankenaar. Animal Tales Volume 1 is a compilation of 15 stories. We read about the big war between the walking and the flying animals; we are told who gets crowned as the king of the animals and we meet sly Jackal and poor, gullible Wolf.